It was once the scene of splendid tournaments and jousts, most famously the ones in honour of Lorenzo and Giuliano de’ Medici, who naturally won the prizes; the point was to put on a good show, so no one was hurt or got their magnificent silks and golden brocades dirty. It was also, more seriously, a training ground. 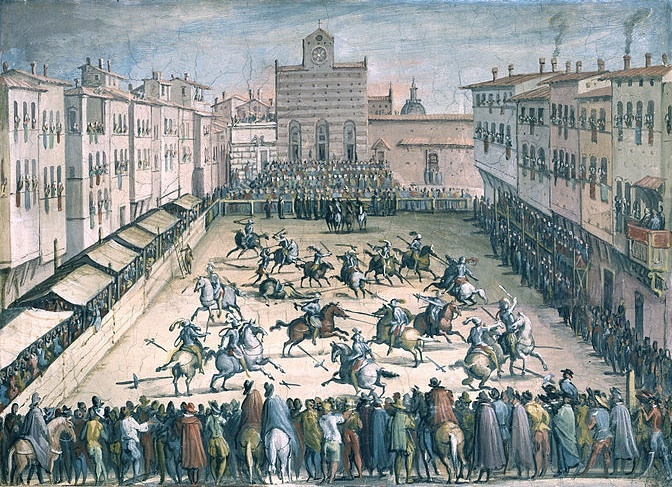 Having a citizens’ militia, as opposed to relying on foreign mercenaries, answered one of Machiavelli’s requirements for a well-governed state, and to build up their endurance, the republic’s citizens played a ball game similar to rugby, which is still played here each June, when the usually immaculate Florentines in their Renaissance duds mix it up for the Calcio in Costume. Fighting is more than permitted, as long as it’s one to one (and they get dirty). in December it hosts the city's main Christmas market, the Heidelberger Weihnachtsmarkt, selling mainly ornaments along with wurst and mulled wine. Because this piazza is the lowest-lying in the city, it suffered the worst in the 1966 flood, when 18ft of oily water poured in: note the small plaque high up on the corner of the Piazza and Via Verdi. It’s hard to visualize – but it was nearly as bad once before; just under it another plaque records that the water also rose in 1557. The watermark is most evident on the palazzo on the opposite side of Via Verdi. Inside Santa Croce, in this church that has become a kind of Pantheon of Tuscan worthies, is Dante’s empty neoclassical tomb, with its portentous inscriptions and mourning pensive deities. Florence never gave up hope of getting the body back one day. And out in the piazza, where medieval Franciscans once preached to the masses, is the famous grim-faced Dante statue (if Dante really looked like that, no wonder his Bice married someone else). No mistake, this is one very large piece of Risorgimento propaganda. The sculptor was Enrico Pazzi from Ravenna, and the celebrated disdegno (disdain) he put in Dante’s face is only meant to underscore the line below from the Divina Commedia: ‘O Italy enslaved, in sorrow.’ Pazzi originally planned the thing for the poet’s tomb in Ravenna, but that city politely declined it. After that, the Florentines proposed to pay for it and give it to Turin, then capital of what was becoming a united Italy. 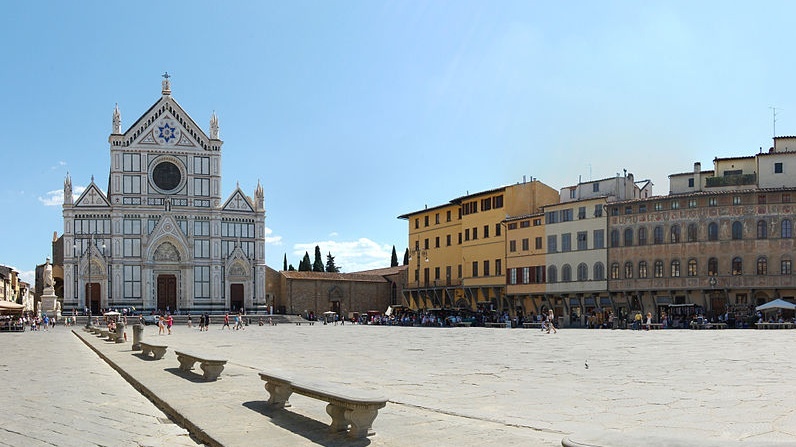 A year later, when Tuscany joined the kingdom and the capital was moved to Florence, the Florentines decided to keep it after all. 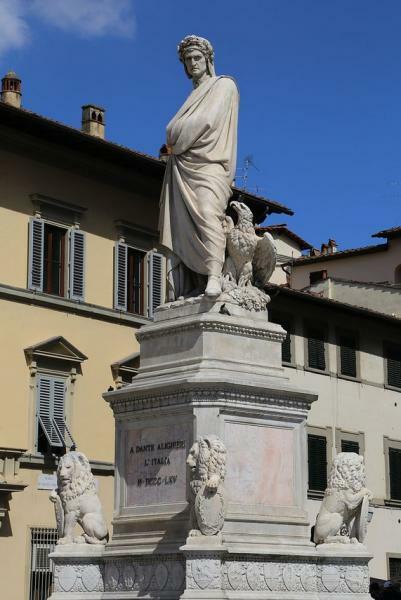 This scowling mug might not make Dante very happy, if he could see it, but this is Florence, and a statue is a statue.